If you're an existing user of LIFXstyle or Hue-topia you may think "that's not new". Versions 1 and 2 did allow you to drag colours around but with version 3 and much new functionality, the drag and drop has been missing. 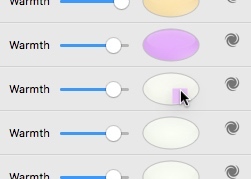 The drag and drop does now carry the warmth / colour temperature value. (And of course brightness and saturation.) So if you've found a nice setting for one lamp, whether that's white with a little warmth or a full-on colour, you can drag the colour to other lamps / groups / locations.